This book follows the fundamental that if you work hard enough and smart enough, you can make good things happen in your life. No one is responsible for your success or your joy. You must search for it and be in a continual state of earning it. To merely succeed is not an end in itself. You must use your success to impact other people...to impact the world...to live life from the inside out. It all starts with the choices you make—they determine the person you will become. 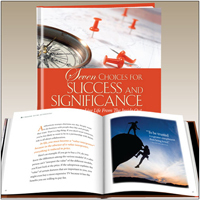 This uplifting book shares some of Dr. Nido Qubein's insights on the tools you need to choose both success and significance in your own life. Success is not a matter of luck, an accident of birth, or a reward for virtue. As this hardcover book outlines, success is a matter of decision, commitment, planning, preparation, execution and recommitment. Success doesn't come to you; you must go to it. 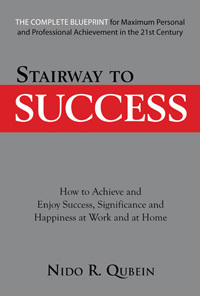 This book will help you find the right steps to achieve greater things in both your personal and professional life. Read it and discover a whole new you! Your power to influence the lives of others in the world around you is as great as your ability to communicate. Those who learn to communicate effectively with people at all levels, of both genders, and from a variety of cultures and backgrounds will be the pacesetters of today's increasingly global marketplace. This best-selling hardcover book will show you how to communicate effectively with diverse audiences. "This book is a premier well spring of earned insights and precise tools. 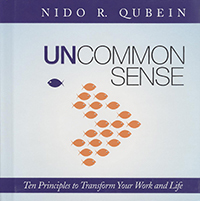 Nido Qubein has created the toolbox for any and all who aspire to be today's master communicators." A sales career can be your route to the good life or your sentence to a life of frustration. The choice is up to you. It has nothing to do with the luck of the draw or the roll of the dice. It has everything to do with the way you think and perform as a salesperson. This hardcover book will give you the techniques, skills and knowledge to make you a super achiever. Learn from these million-dollar ideas to help you master the art of selling in any business. A beautiful hardcover book of quotes and thoughts extracted from Nido Qubein's speeches and seminars. Arranged by topic, each quote is original, inspiring and thought-provoking. You'll find yourself reaching for this book when you need encouragement and direction as you journey through life. A great gift for someone you love or as a coffee table keepsake to add a new source of inspiration and motivation to your life. Winners are made---not born! You can reach your goals, fulfill your dreams, enjoy success and significance. Packed with inspiration, encouragement, and strategies to accomplish your goals, this book is a treasured resource for achieving success. Many businesses, universities, and entrepreneurs use this hardcover book as the ultimate program for personal and professional achievement. Yesterday's thinking looks at the tasks people perform today and asks,"How can we train our future employees to do these things?" Today's thinking looks at the kind of people needed to fulfill corporate strategy for the future and finds ways to teach employees to become those kind of people. This book gives you a proven, step-by-step system to grow a well-trained, educated and motivated team for the 21st century. Translated in Spanish from Nido Qubein's popular Achieving Peak Performance title, this paperback book offers a cross-cultural perspective into managing your professional resources. If you want to reach for success in life, the most important asset is a faithfully optimistic, winning attitude. 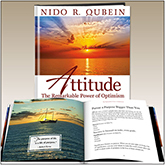 Nido Qubein shares how a positive attitude can transform your life. Whether you reach success or failure has little to do with your circumstances; it has much more to do with your attitude, with your faithful courage, and with your choices! Ignite change within yourself. 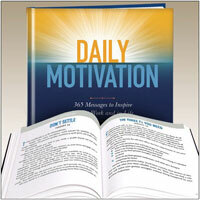 Daily Motivation delivers 365 pages of quotes, anecdotes, and poetry accompanied by stunning images. Intended for people who want to center their positive outlook routinely, this title can help you grow and change each and every day. The future is not for the faint-hearted; it belongs to the brave. The uplifting messages in Daily Motivation will inspire you on a regular basis and give you the courage you need to transform yourself. The only person stopping you from making your dream a reality is you. The future is all yours! Your life is measured by who and how you influence and impact others. Purpose leads to passion, energy, action, success, and significance. And significance leads to the one result we all want--happiness. 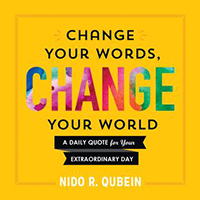 This book of daily quotes includes thoughts extracted from Dr. Nido Qubein's books, speeches, seminars, and recordings. Read a page each day and transform your world. These daily quotations can spark a new direction and a new attitude in your life. People tend to order their lives according to "conventional wisdom," a generally accepted set of principles that may include centuries-old folk sayings or that may have arisen from contemporary experience. These sayings and beliefs have become so ingrained in the public mind that they are often referred to as "common sense." In both your business and personal life, following "conventional wisdom" is usually the safe approach. But, the people who make a remarkable difference in the world are typically those who examine "conventional wisdom" with a critical eye, using "uncommon sense." This book seeks to encourage a creative look at things often taken for granted and to provide fresh insights into our way of thinking and living.